The following entries discuss some strategies that I have found to be consistently helpful during my years of experience with EMI at university. They address the fact, explained in another article, that teacher talk by itself tends to be less effective when both teacher and students are working in a language they are not fully proficient in. These strategies fall under the general label of learner-centred instruction – what in Spain has been called metodologías activas. As I’ve written elsewhere, I generally believe that such methodologies tend to be more effective than traditional teacher-focused instruction (clases magistrales) with most students and in most scenarios. If the class is to be cognitively demanding, it is a good idea to plan for some activation tasks. Students need to warm up, as it were, and connect with their previous knowledge of the topic discussed, in order to better understand what is coming. In the case of EMI, students will also welcome activation of language: concepts that have already been discussed, or language items that will be useful to talk about them. Remember that learning in a foreign language (FL) requires an extra effort, as well as increased exposure to the target language – mainly, because the concepts are harder to spell, pronounce, and memorize than if they were taught in L1. In my previous entry, I wrote about the language benefits of using authentic texts. Think whether you can expose students to authentic or adapted materials in your field: reports, technical sheets, textbook chapters, newspaper or magazine articles, TED Talks. Homework reading can then become a pre-lecture task, and the class can start with feedback on the reading. Fostering occasions for peer collaboration – also in your classroom! Peer collaboration is a very powerful tool. Research in education has suggested that that peer explanation tends to be more effective than teacher explanation, and is especially valuable as a scaffold for weaker students. In the case of EMI, remember that the scaffolds need to be not only cognitive/content related but, also, linguistic. So, don´t be afraid to allow time in class for students to do tasks or solve problems in pairs or groups! 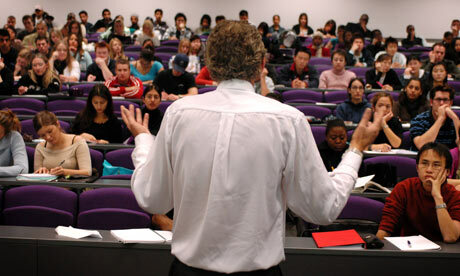 To continue with the example given before, students can read an authentic text for homework, prepare answers to some questions, and then you can begin the class with a brief period (10 minutes) for students to compare their answers, and maybe do a follow-up task, before you conduct the feedback and teach or clarify any content. Tip – If you have very large groups, where oral feedback and reporting can be hard to manage, ask students for a written outcome. This can be submitted on paper or shared online (shared document such as Google Docs, or using apps such as Kahoot or Mentimeter). Teacher explains content for the entire length of the class. Very few interruptions from students. Teacher conducts feedback to the reading task. This feedback naturally leads to lecture-time, where the teacher clarifies areas of difficulty, introduces new concepts, etc. Students take notes. Maybe some students ask for clarification. Students read the text and answer the questions. Students compare their answers. Weaker students or students who failed to do the homework get a chance to ask for help. All (or most) students get involved, as the teacher expects an oral or written outcome for each group. What are your thoughts on these strategies? Do you think they can be effective in your own classes?